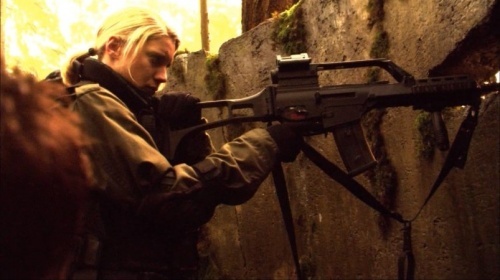 Kara ''Starbuck'' Thrace ([[Katee Sackhoff]]) wields two [[Skorpion SA]] vz.61 Czech machine pistols after hooking up with Helo on Caprica and just before encountering the Resistance. 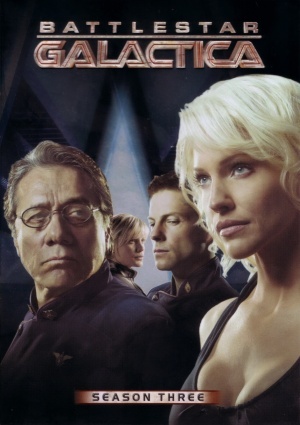 Battlestar Galactica is the "reboot" of the 1978 ABC sci-fi television series. 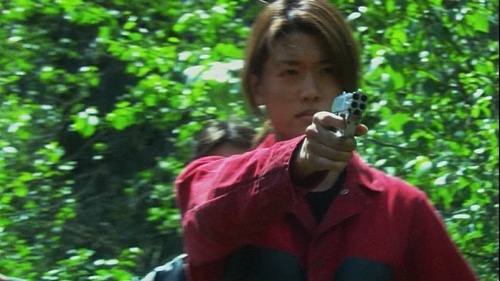 Unlike the original series, the majority of the weapons used are authentic weapons visually modified for the production. 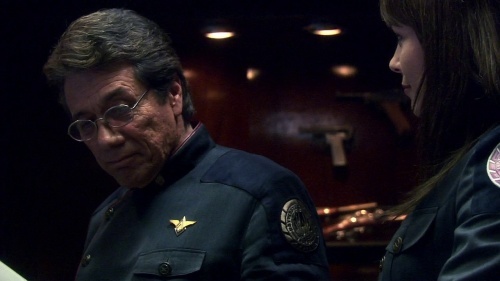 A heavily modified Smith & Wesson Model 686 L-Frame revolver is portrayed as the standard Colonial sidearm in both the Battlestar Galactica mini-series and the first season. Among other features the weapon has an under barrel explosive launcher (like the old LeMat "grapeshot" barrel,) although the explosive launcher was never used onscreen. The Miniseries version had hardly any real functionality and was redesigned almost from scratch for Season 1 when scripts required more specific actions with the guns. 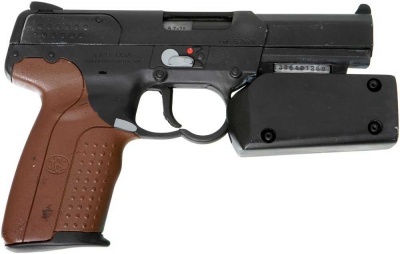 After that it was redesigned again and, starting with the early second season, the original sidearms have been nearly completely replaced by the FN Five-seveN. These guns were inconvenient as they had to be disassembled before they could be reloaded. They later returned during the flashback scenes in "Razor." 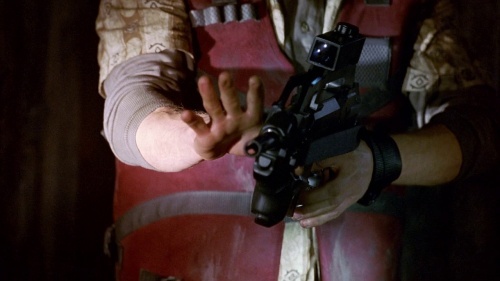 The gun appears to have been intentionally designed to resemble the gun used by Rick Deckard in Blade Runner (probably to emphasize the realistic tone of this series, as opposed to a "future show with laser-guns"). 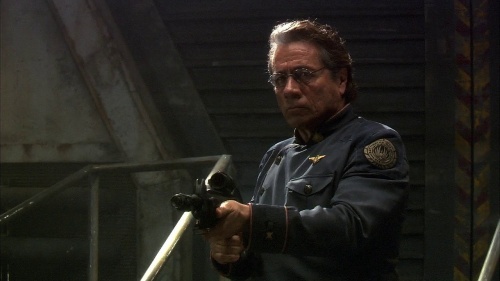 It also notable that series star Edward James Olmos also played the mysterious police officer Gaff in Blade Runner. Sharon (Grace Park) holds the Colonial Handgun in the miniseries. 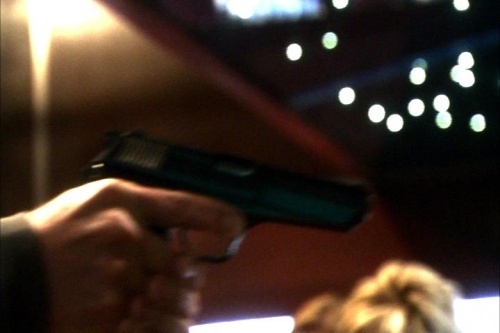 Closeup of the handgun pulled by Helo in Season 2's "Resistance". 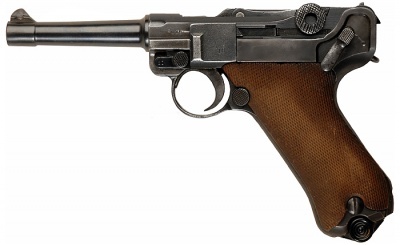 From Season 2 to the end, this weapon became the standard Colonial Military sidearm. 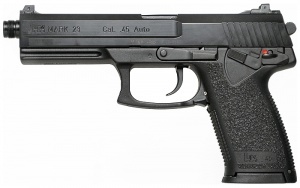 This appears to be based off of the FN FiveseveN. It keeps the underbarrel explosive launcher. This changeover allows for real semi-automatic fire and makes use of the existing stores of 5.7 x 28mm blank ammunition. 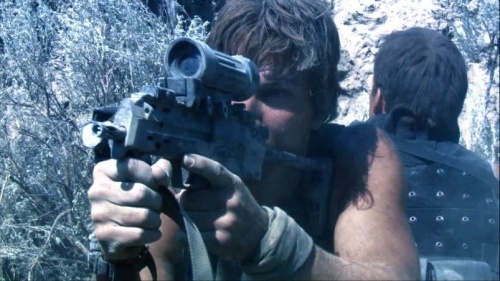 The explosive launcher was muzzle loaded, and was featured in the second season episode "Valley of Darkness," but not prominently afterward. 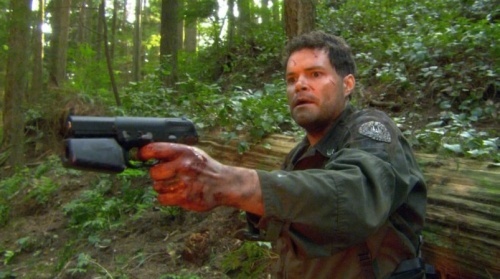 In Season 2's "Fragged" (S2E03), Chief Galen Tyrol (Aaron Douglas) is seen with redesigned Colonial Sidearm. 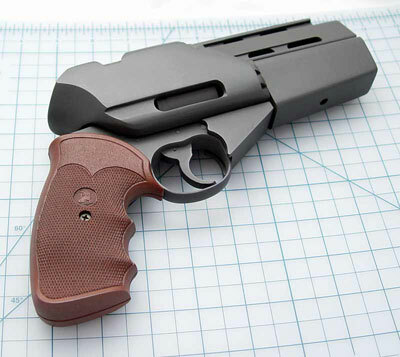 Referred by Chief Tyrol as the "Stallion", this 4 shot .357 Magnum is in reality a COP 357 Derringer. 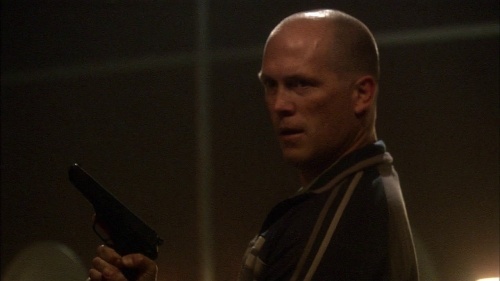 Seen pulled by both "Caprica" Sharon (Grace Park) and Meier (James Remar) in Season 2's "Home, Part 2" (S2E07). 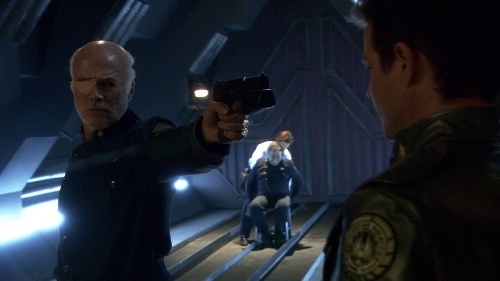 Romo Lampkin (Mark Sheppard) also threatens Lee Adama with one in Season 4's "Sine Qua Non" (S4E08). "Caprica" Sharon (Grace Park) holds the Derringer on Cmdr. 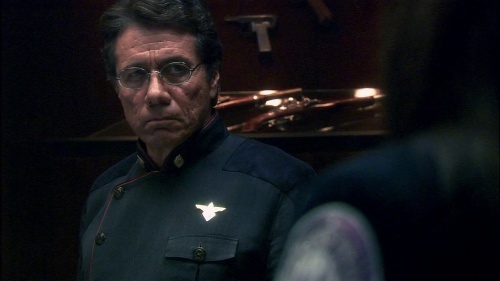 Adama in Season 2's "Home, Part 2" (S2E07). Closeup of Sharon handing over the Derringer. 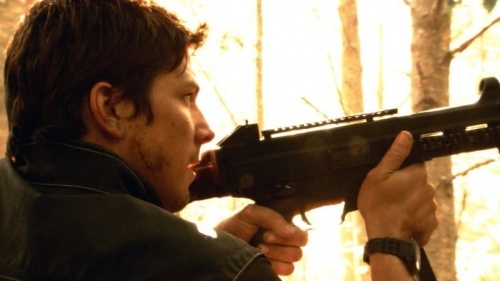 The Heckler & Koch Mk 23 Mod 0 is one of the two handguns Samuel Anders (Michael Trucco) is seen handling while on Caprica. 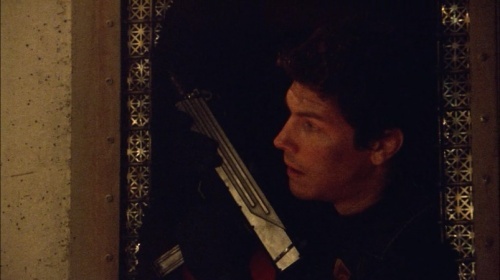 In addition to his UMP in his left hand, Sam Anders (Michael Trucco) is seen pulling a H&K Mk23 handgun fitted with a tactical light in Season 2's "Resistance". 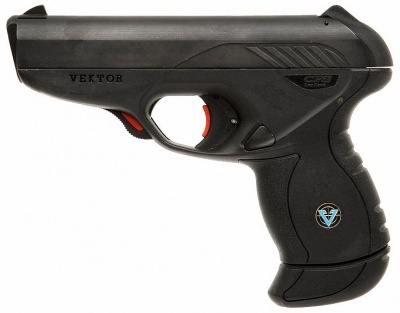 Cropping up now and again is the South African Vektor CP1. 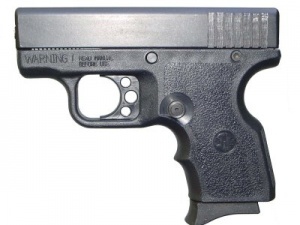 The handgun is mostly seen in the hands of non-military personnel, although they appear to be issued to the security detail of President Laura Roslin (Mary McDonnell). 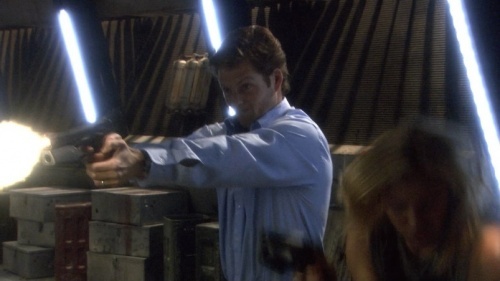 Lee Adama (Jamie Bamber) also uses one to execute a criminal in "Black Market." 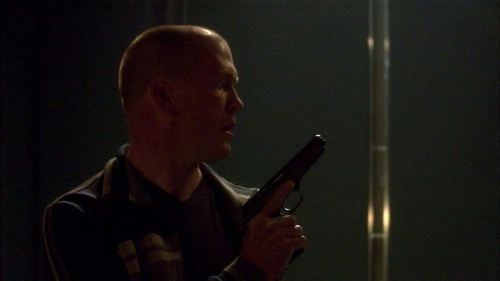 Members of President Roslin's security detail pull their Vecktor CP1 handguns in Season 1's "Kobol's Last Gleaming, Part 2" (S1E15). 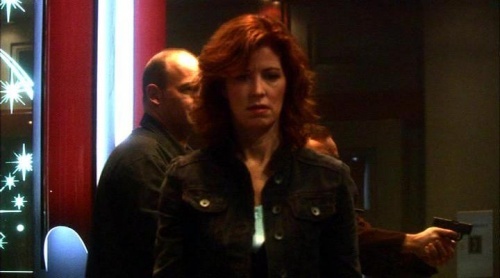 An Intratec CAT 9 is seen in the hands of one of Sesha Abinell's (Dana Delany) allies in the Cloud Nine Lounge in the Season 2.5 episode "Sacrifice". 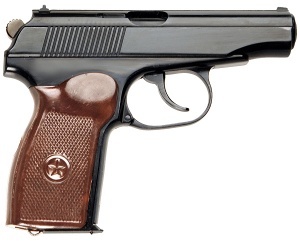 A Makarov PM is used by Sesha Abinell's (Dana Delany) during the siege of Cloud 9. 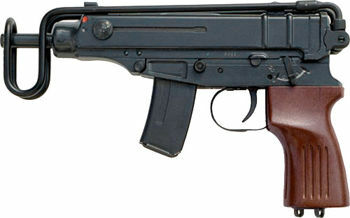 A CZ 52 is used by one of the terrorists during the siege of Cloud 9. 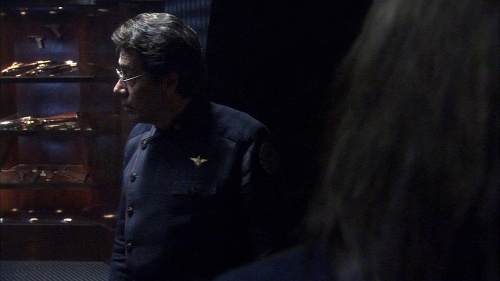 A Number 5 also holds one to President Baltar's head in "Precipice" to force Baltar to sign death warrants. He uses it to shoot a Number Six to demonstrate his resolve. Another one of the sidearms in the series by Anders is the Desert Eagle. 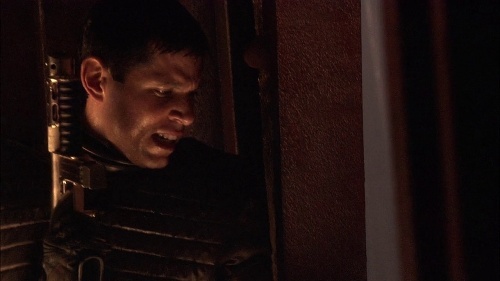 He briefly loses it after blowing up a Cylon occupied building on Caprica when D'anna (a Number 3) siezes it and threatens to kill him before being beaten to death by a Number 8. The weapon is nickel plated and is sometimes replaced with non-gun version. 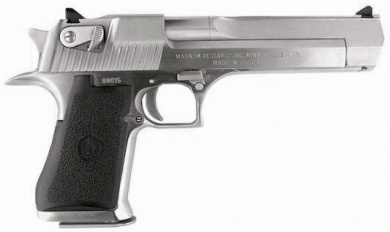 Desert Eagle MK VII - .357 Magnum w/ nickel finish. 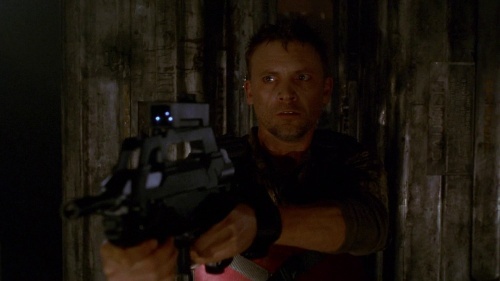 For the mini-series and Season 1, the FN P90 was the main assault weapon of the Colonial Marines aboard the Galactica. 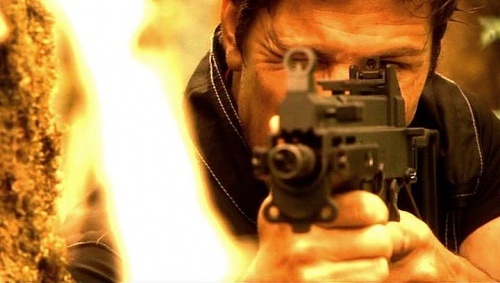 The attachments for the weapons (flashlight, red dot sight) are somewhat the norm for the "real world" the only difference being the attachment of a suppressor which seems to be more for dramatic effect than anything else, though may have been used to disguise the use of PS90 semi-automatic civilian models. 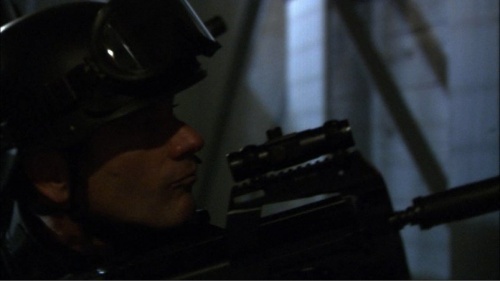 In later seasons, the Beretta Cx4 Storm would replace this SMG, most likely due to the P90's prominent use in the series Stargate SG-1. 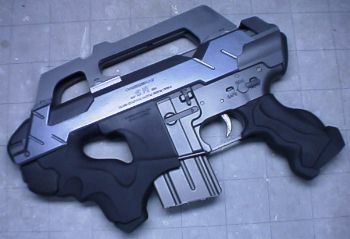 However, the P90 would still be used (in a more minor role) throughout the run of the series. 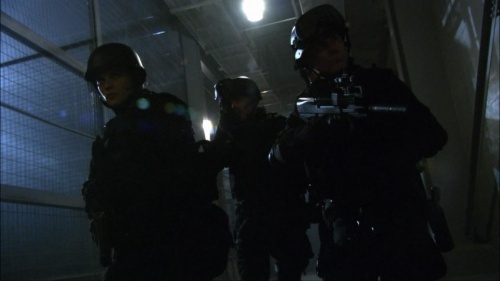 A Colonial rescue team led by Starbuck is seen armed with the FN P90 in Season 1's "Bastille Day". 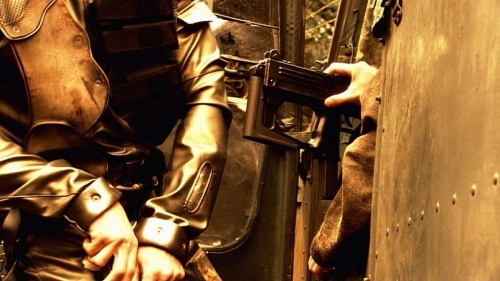 A Colonial Marine armed with the P90 in "Bastille Day". 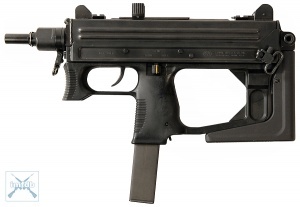 Another weapon used by the Colonials is the Heckler & Koch MP7A1. The major addition to the weapon itself is an ELCAN optical sight rather than a red dot or basic iron sights. 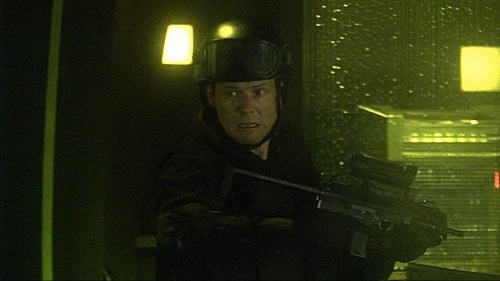 The Heckler & Koch UMP is seen in the hands of Sam Anders as well as some of the Colonial Marines guarding the Pegasus. 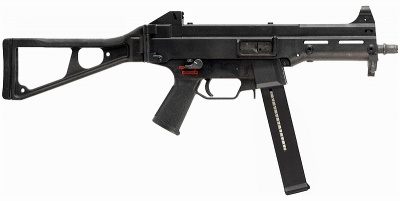 The UMP in the series doesn't appear to have been fitted with any special modifications. Anders holds the UMP in "Resistance". Note that the weapon is still on "Safe". 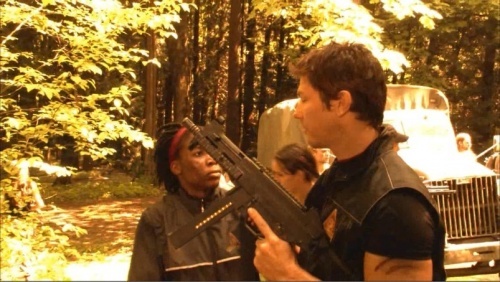 In Season 2's "Resistance", the UMP is seen being held on Kara "Starbuck" Thrace (Katee Sackhoff). Anders with the UMP in Season 2's "The Farm". 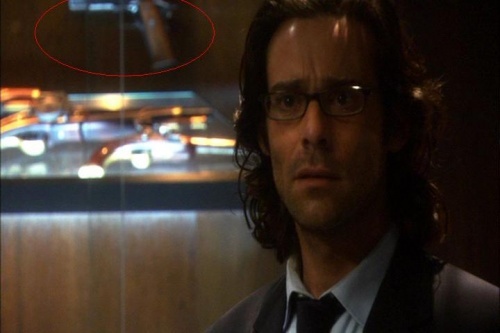 The Beretta M12 is one of the weapons recovered from the hidden cache during the escape from New Caprica. 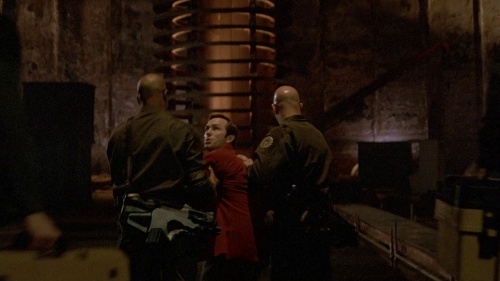 It was first seen in the hands of Resistance members in season 2. 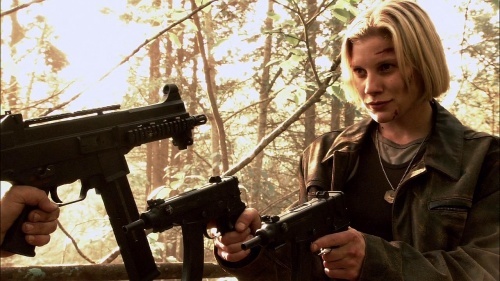 Kara Starbuck Thrace (Katee Sackhoff) wields two Skorpion SA vz.61 Czech machine pistols after hooking up with Helo on Caprica and just before encountering the Resistance. 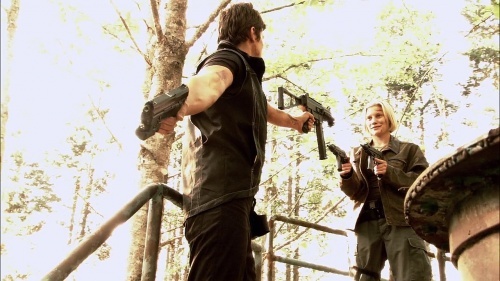 In Season 2's "Resistance", Kara "Starbuck" Thrace (Katee Sackhoff) holds dual Skorpions. 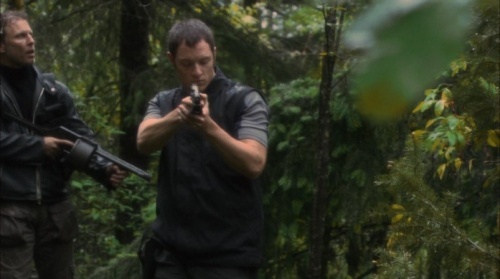 Kara holds the Skorpions when she and Helo take fire in Season 2's "Resistance". 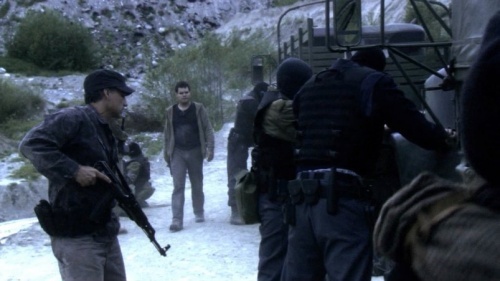 The Ruger MP9 is seen being carried by Helo just before he and Starbuck encounter the Resistance. Anders also is seen using a Cobray M11/9 non-gun fitted with a thread protector. 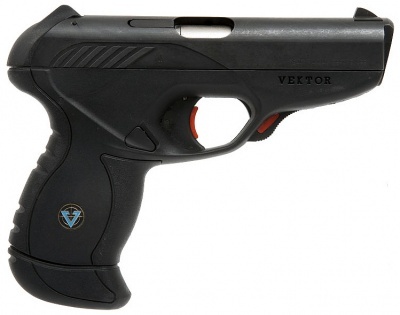 (Based on photographic evidence only) A pistol version of the Feather AT-9 Carbine was apparently used as the basis for the Cylon Pistol. 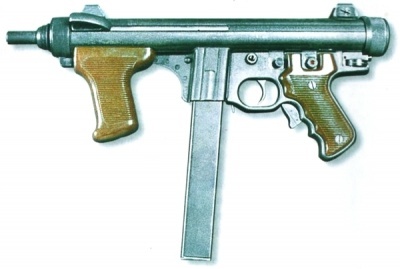 The pistol grip was replaced with a FN FAL grip and an additional 'notch' was cut into the receiver tube to hold the bolt, since it had been converted into an open bolt select fire weapon (The original AT-9 was a closed bolt semi auto only firearm). 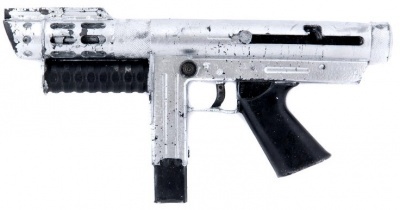 From Season 2 to the end of the series, the Beretta CX4 Storm is the standard long gun of the Colonial Marines on board the Galactica and the Pegasus. The weapons themselves have various attachments including a rail system with red dot sight, flashlight attachments, and a custom flash hider. 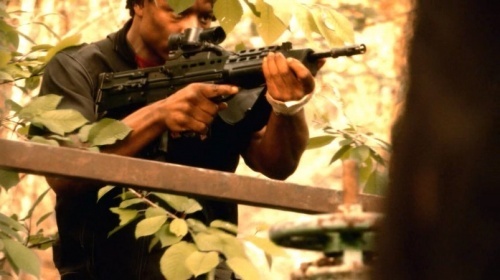 The SA80 is seen in Season 1 flashbacks as well as in the special features of the Season 1 DVD. 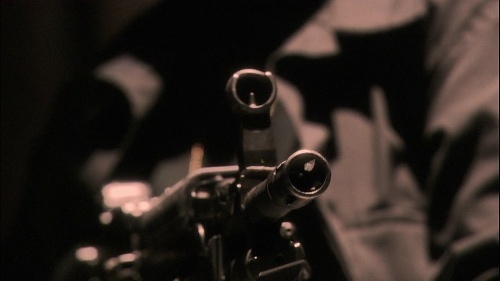 The weapons in the show themselves lack the optical sights and have the whole lower receiver and muzzle guard painted white indicating they may only be used for ceremonial purposes. 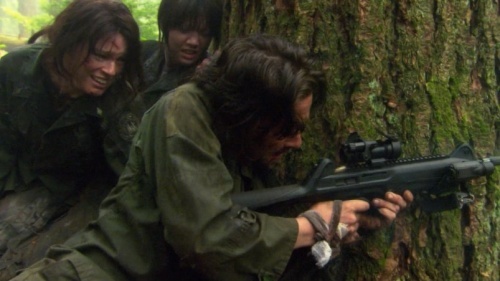 In the Season 2 episodes "Resistance" and "The Farm", a couple of SA80s with the SUSAT scope are seen in the hands of the resistance fighters on Caprica, suggesting that the SA80 is a standard issue rifle in the Colonial military. 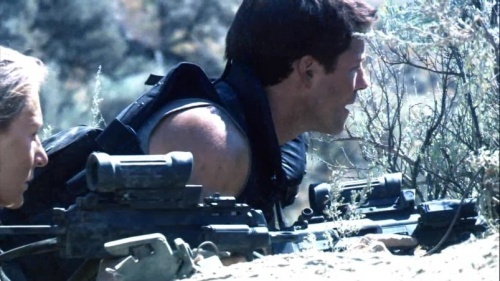 Glimpsed occasionally throughout the series is the Heckler & Koch G36K model assault rifle. Seen almost exclusively in the hands of Colonial military personnel it could be that this weapon is a substitute standard weapon for the Colonial Marines or the armorer were suggesting this gun for Starbuck to use specficly on her mission. 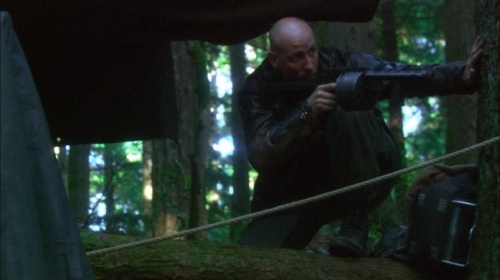 The Norinco Type 84S is another weapon seen in the hands of a Resistance fighter after its recovery from the arms cache on New Caprica. 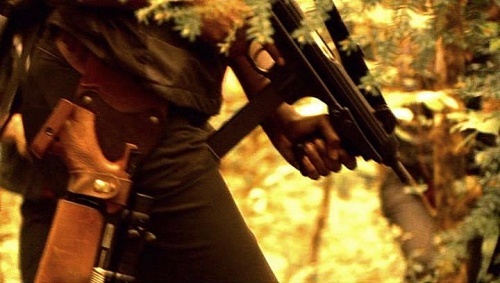 Not clear what the exact weapon is but it may have been a folding stock Norinco 84 given the shape of the magazine making it a 5.56mm weapon and not a 7.62mmx39. 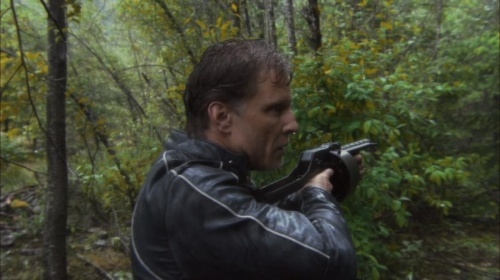 A Norinco Type 84 rifle was seen in the hands of a resistance fighter on Caprica in the Season 2 episode "Lay Down Your Burdens: Part 2"
A modified version of a Remington 700 is seen in the hands of a resistance fighter on Caprica. This particular weapon has a telescopic sight and is fitted with a Choate Ultimate Sniper/Target riflestock with a bipod. 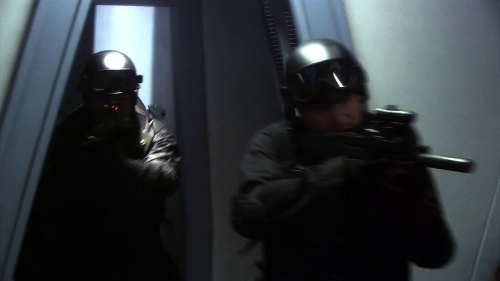 In the Miniseries, the Colonial security personnel on Galactica are armed with a bullpup assault rifle. 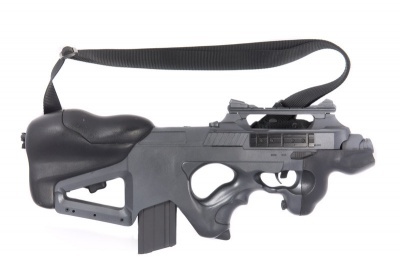 It bears a resemblance to a short-barreled FAMAS with a Picatinny rail mount. This rifle was actually designed by Masamune Shirow for the Dominion: Conflict comic series, and is known as the Seburo MN-23. 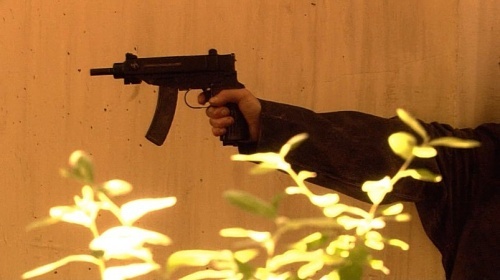 No known working model of this gun has been seen, so odds are during the mini-series they were the airsoft props with added flashlights. 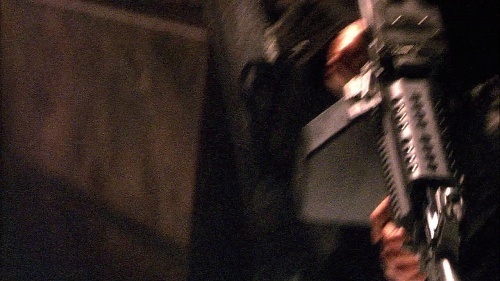 Obviously since this weapon doesn't fire or technical crew changed their minds to the Cx4, this weapon along with the Raisen only appeared briefly during one scene on the Ragnar station during the mini-series. 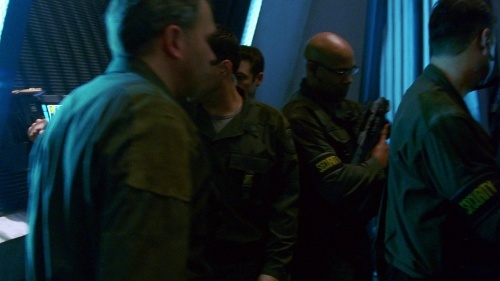 We can assume this rifle is a standard weapon for security personnel onboard Galactica as oppose to what the Marines carry. 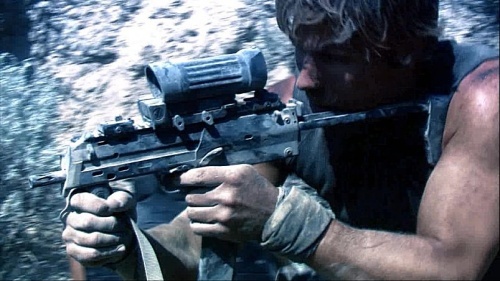 The weapon possessed by Leoben Conoy (a Number 2) at Ragnar Station is a fictional variant of the AR-15, known as the Close Quarters Battle Weapon Type Zero, aka the "Raisen". 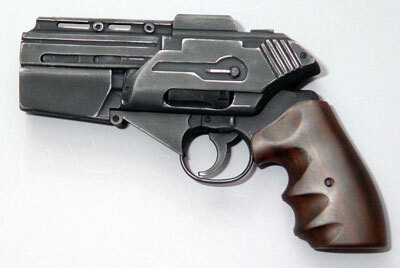 It is a model gun designed by Poseidon Industries of Japan, a company that also makes the Seburo MN-23. 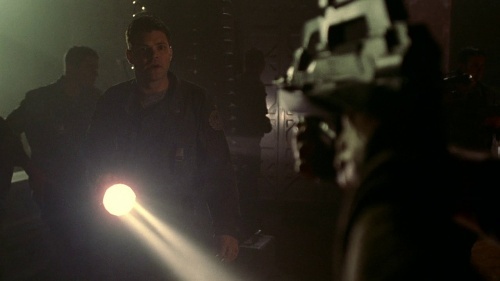 In the Mini-series, Leoben's Raisen had a flashlight, sling and sight attachment to it. It is most likely a non firing prop since no known working model of the Raisen has even been seen to my knowledge. 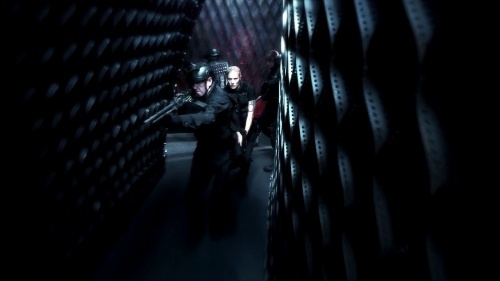 Obviously since this weapon doesn't fire or technical crew changed their minds to the Cx4, this weapon along with the MN-23 only appeared briefly during one scene on the Ragnar station during the mini-series. 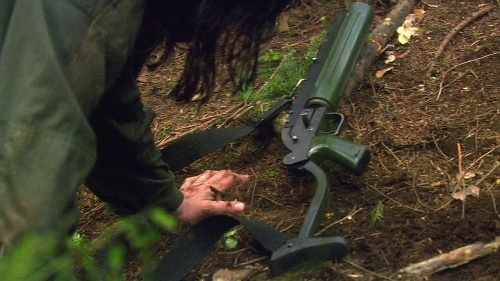 An FN Minimi is glimpsed briefly in the Razor movie the Para version of this venerable SAW is used in the final assault on the Cylon Basestar. 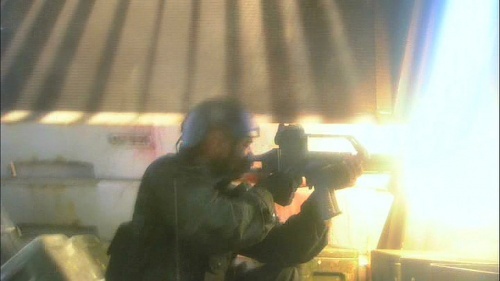 An M60E3 is used by Colonial Marines during the assault on the Cylon colony in the series finale. This distinctive South African shotgun Armsel Striker makes a few appearances in the series but not in its primary role. 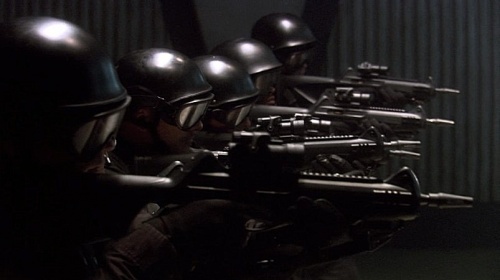 Instead, as in numerous shows, it's shown as a grenade launcher. 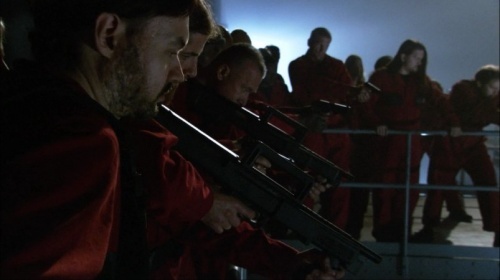 The Mossberg 500 Bullpup conversion of the classic pump shotgun is carried by the rioting prisoners on the prison ship. Presumably a law enforcement issue weapon since it is not seen in the hands of any Colonial military personnel. 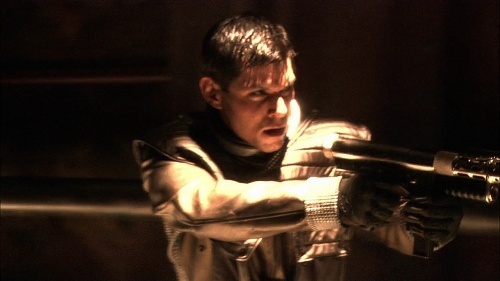 During the siege of Kobol, Chief Tyrol is seen using this single shot grenade launcher against the Cylon radar dish. The weapon itself appears to have some ornamentation (a jacket over the barrel) so it is a little difficult to identify. 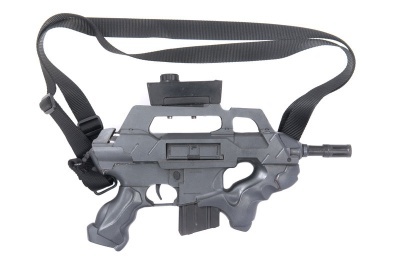 However, given the shape of the stock it is not a stand alone M203 but the Cobray M79LF. 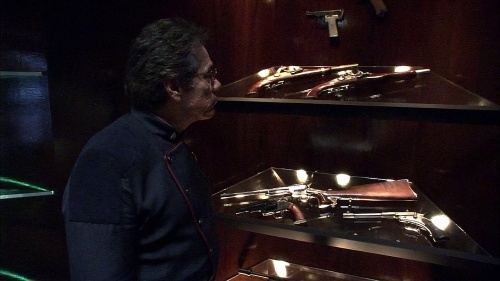 A pair of Flintlock Pistols are on display in Adm. Cain's office in Season 2's "Pegasus". 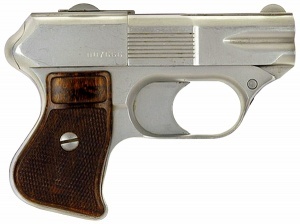 The Luger P08 is another weapon seen in a display case in Cain's office. 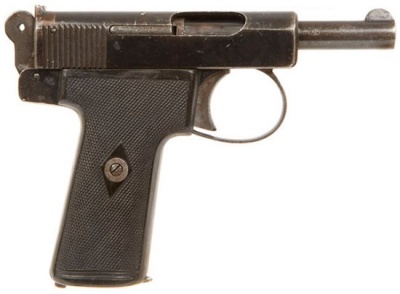 The very rare Webley-Scott Model 1906 handgun also holds a place in Cain's collection. Alongside the Colt is a Smith and Wesson Schofield.